Hunkered down in a small brick church as it was battered by Hurricane Florence’s 100 mph-plus winds and rain, Neal and April Williams looked with dread at the images on their cellphones of the home they had evacuated. Their daughter, Arianna, 3, played nearby, still unaware of the havoc the storm was causing. The day that the hurricane came, we had to hurry up and get to the shelter. It was really scary outside. You always want to do the best for your family, and whenever you can’t protect your home for your family, there’s nothing you can do, that’s really hard. My father-in-law called me and said that the rain had got to my windows of the house, and I knew the water had already got in there and all my daughter’s stuff was gone. Whenever you know that you’re going to lose everything, and you don’t know how to tell your child, that’s the hardest part. When you think about it, if you could put yourself in their shoes, some of them have lost everything. There are families need to completely uproot and start over, and so by us coming into the market with our Mobile Response Unit, we’re able to help expedite that process and get them back to some level of normalcy. I mean, they responded really, really fast. And us, as a family, after losing everything, we want everything to move fast, and the response was just there. Obviously, deploying a mobile response unit is not something that we need to do or we have to do, but we feel it’s the right thing to do, is going out and just meeting with our customers. Thank you, I hope everything goes well with you all. Very close to my heart for companies like Wells Fargo to actually show up and be here because it shows that they know where you’re at. They know what you’re going through. We deploy a Mobile Response Unit to our community to show the community that we care. And also, by walking the walk when they come, in to put ourselves in their shoes and show them that we want them to recover and get back on their feet as quickly as possible. After I left the Mobile Response Unit, it was really a relief to know that we could start all over and just have a clean slate. My vision is to start over new in the home that we’re going to be in for a lifetime. It’s a new house that my daughter can grow up in, she’ll call her childhood home. The sender of the pictures, Neal Williams’ dad, captured the steady creep of the Lockwood Folly River toward their home a few miles away in Bolivia, North Carolina, until the waters reached their windows. Not long after, the pictures stopped coming because he had to evacuate his own home. “We realized then we were losing everything, and our house was probably going to be a total loss when we were able to go back — about a week and a half later, as it turned out — and it was,” Williams said. April, Neal, and Arianna Williams with Wells Fargo team members Cathy Yann, Liz Ruiz, Bailee Schultz, and Steve Porter, at the Mobile Response Unit in Wilmington, North Carolina. One thing the Williamses didn’t have to worry about after the storm was their mortgage and banking. Acting on lessons learned from Hurricane Katrina and other disasters, Wells Fargo dispatched its Mobile Response Unit and Customer Assistance Recovery Effort team of volunteers to North Carolina to set up mobile recovery centers in Wilmington, New Bern, and Fayetteville — providing personal help to the Williamses and other impacted customers. The help was in place locally two weeks after Hurricane Florence’s Sept. 14 landfall near Wilmington and once roads had been reopened for travel. CARE team specialists at each location endorsed insurance checks for Wells Fargo mortgages; explained next steps in the property damage process; answered questions about the company’s ability to waive certain fees on auto loans, credit cards, personal loans, lines of credit, and other disaster relief services; and discussed options for longer-term assistance if needed. The Williamses’ mobile home in Bolivia, North Carolina, when they were finally able to return home a week and a half after Hurricane Florence made landfall. "The most important thing about mobilizing for customers is to be there for them quickly in their times of dire need, and when they need us most." Wells Fargo dispatches the unit and team based on the factors such as the severity and scope of the damage, the number of customers affected, and Federal Emergency Management Agency disaster declarations. “The creation of the Mobile Response Unit and CARE team really was a result of Hurricane Sandy,” said Rullah Price, who directs the community outreach effort for Wells Fargo Home Lending. 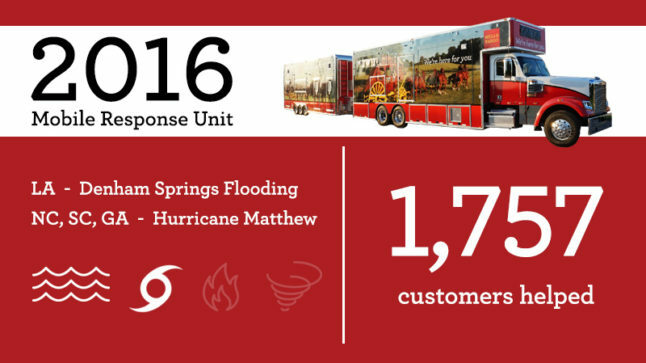 Since Hurricane Sandy in 2012, she said, the unit and team have deployed 18 times after tornadoes, hurricanes, wildfires, and other disasters — allowing 504 Wells Fargo team members to deliver disaster relief to more than 6,500 customers in their time of need. CARE team members have already served more than 500 customers in North Carolina alone since Oct. 1. “We realized it was important to mobilize our team to multiple locations in a very timely way and developed an office on wheels where customers could come and meet with us in a comfortable environment and talk to our disaster-relief specialists — not just about their home, but about their car loans and other consumer loans,” Price said. “Each person’s situation is different, and the most important thing about mobilizing for customers is to be there for them quickly in their times of dire need, and when they need us most. Liz Ruiz is one of those team members willing to drop everything to help — a financial first responder of sorts. The Wells Fargo Home Lending account resolution specialist and CARE team member flew from San Antonio, Texas, to Wilmington to be on-site Oct. 1 when the mobile unit opened its doors. This was her third disaster deployment: She also deployed to Jacksonville, Florida, after Hurricane Irma and to Houston after Hurricane Harvey. While in North Carolina, Ruiz not only served in Wilmington, but also traveled nearly 90 miles up the coast to pitch in and help CARE team members assisting customers in New Bern. Ruiz met the Williams family when they visited the mobile unit in Wilmington, and their story left her in tears. In 1970, at age 13, Ruiz and her family fled Corpus Christi, Texas, for San Antonio when Hurricane Celia destroyed their home. Another team member who stepped up to help is Niki Morales, a Wells Fargo home preservation specialist from Des Moines, Iowa. Inside a tent set up outside a Wells Fargo branch in New Bern, Morales helped a steady stream of flood victims — customers like Michelle Parker from Pollocksville. The flooding in the town became so severe that a special search and rescue team from New York City patrolled Main Street Sept. 17 looking for victims in eight-foot-deep floodwaters. Miraculously, there were no fatalities. “I lost my house and my farm in Pollocksville,” Parker said. “The people at Wells Fargo in New Bern were very helpful and understanding as we talked about options for my mortgage, credit card bills, and personal and business lines. The whole town is devastated, and there were only 12 houses in the entire town that didn’t flood. For Morales, on her first disaster deployment, the experience was eye opening. “Being from Iowa, I have never experienced disasters like this,” she said. “To hear their stories and see the pictures they showed us of their homes, and to see how they continue to keep moving forward and are still so thankful for what others are doing for them definitely made what I did both rewarding and life-changing. “Even people who weren’t our customers and saw us in our red Wells Fargo CARE T-shirts walked up to us and thanked us for coming down as we traveled back and forth from our hotel in Wilmington to New Bern,” she said. While the experience was new for Morales, it was very familiar for Mario Shaw, a CARE team veteran from San Bernardino, California, who served in the very first CARE team deployment in New York after Hurricane Sandy, and who has answered the call more than 10 times since then. He’s served in large-scale deployments inside the Mobile Response Unit after hurricanes and wildfires, and he’s sat in Wells Fargo branches in small-scale deployments that take place year-round, such as helping customers after hailstorm damage in Colorado this summer. Along with its mobile units and CARE team, Wells Fargo has donated $2 million for Hurricane Florence relief, with $550,000 going to the American Red Cross and the rest for North and South Carolina nonprofits organizing local relief for individuals and small businesses. Wells Fargo customers have donated an additional $262,435 for Florence victims at the company’s ATMs through its latest ATM campaign for the American Red Cross, and Wells Fargo’s Go Far® Rewards customers have redeemed $42,164.40 of their available rewards directly to the nonprofit’s relief efforts. E4E Relief, the Foundation for the Carolinas subsidiary that administers Wells Fargo’s WE Care Fund disaster-assistance grants to the company’s team members, has already awarded $442,938 in WE Care Fund grants to team members affected by Hurricane Florence. Last month, Wells Fargo contributed $3 million to WE Care for Hurricane Florence relief and announced a $1 million challenge grant matching individual donations up to $1,000 during the company’s 2018 Community Support Campaign. As of Oct. 8, team members had donated $814,243 to WE Care with over $632,535 qualifying for the match. Team members in impacted areas created care packages to thank the American Red Cross volunteers and first responders so critical to their communities’ safety. Meanwhile, Wells Fargo team members in Durham, North Carolina, collected 45 boxes of nonperishable food for delivery to storm victims by the Food Bank of Central and Eastern North Carolina. Shortly after Hurricane Florence made landfall, and about the time Neal Williams realized his home was gone, he also thought about his pending mortgage payment. As if on cue, he noticed a Wells Fargo CARE team email on his phone that told him not to worry: help was on the way, including a 90-day moratorium on the mortgage payment now due on his flooded house. After also receiving an email from Wells Fargo about the Mobile Response Unit and its disaster-relief services — sent by the company automatically to customers within 15-miles of each CARE team’s location — the Williamses connected with Wilmington CARE team leader Steve Porter, Leland Branch Manager Yara Aguilar, and Personal Banker Yadira Gamble. Together, they helped the family get $52,000 in insurance checks endorsed and completed the wire transfer to their account. Aguilar and Gamble took the couple through the teller line and waived the funds availability delay, triggered because of the check amount, so the Williamses could immediately deposit the money into their account. Added Neal Williams, “It’s very close to my heart for companies like Wells Fargo to actually show up and be here on ground zero with us because, as a customer, you want that from your company and the people that you do business with. It shows they know where you’re at and what you’re dealing with.